With the bathrooms in my home at the top of our renovation list, sometime in the future, cleaning is a little more difficult. Everything is not fresh and new, but I like the tile to look that way. Tile cleaners from the store can be very harsh to use and by the time you are finished, the fumes are making your head spin. 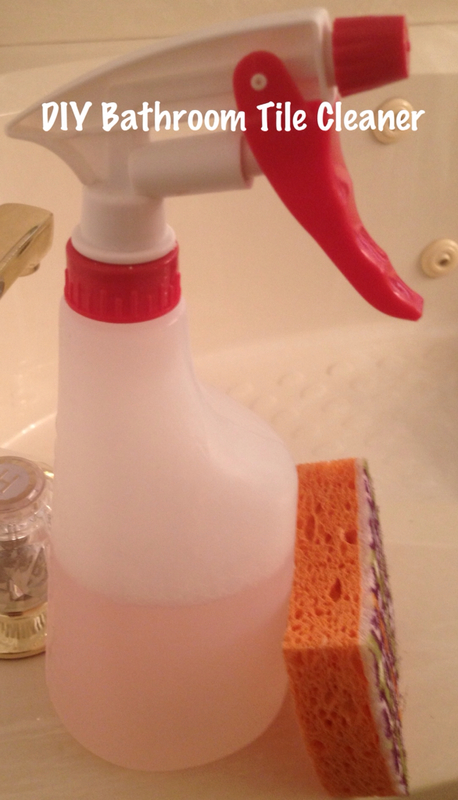 This DIY Bathroom Tile Cleaner is one of the best cleaning products I have found for avoiding these harsh chemical fumes and the bonus is - it really works. You can make it in a spray bottle and have it handy to use on all tiled surfaces. It cuts through any soap scum and makes the tile and grout sparkle. I really like it for my textured shower door, always tricky to get clean. This cleaner makes it shine too. To make in a spray bottle - mix 1/4 cup sudsy ammonia, 1/8 cup white vinegar, 6 T baking soda and 2 1/2 cups water. Shake gently to mix and use on tile and grout or other bathroom surfaces. Thanks for the great tip! I'll have to try it. I have been using the blue Dawn mixed with vinegar for major bathroom cleaning but I would like to try this too! Thanks for sharing. I'll have to give this a try. Thanks for sharing this. I need to tackle the tile floors in our upstairs baths. Weird...yesterday I was just wondering what I could use on my tiled shower. It really needs some TLC. You solved the dilemma. I am definitely going to give this a try. Dumb question...sudsy ammonia...is that just regular ammonia or something differemt? This is great Vicki! I agree, some of the OTC products are really harsh. I try to use a mix of "the strong stuff" with the natural, environmentally friendly products. Do you really mean baking powder, or baking soda ? Just curious 'cause I'd like to try this. Thanks. I made the correction - it is baking soda of course! This looks like a great way to save money on cleaning products! I'm pinning this hoping to try it sometime! I'm stopping by from Serenity Now (#4 Bowl Licking Good Guacamole) Have a great weekend! Hi Vicki, I pinned this recipe a while back, but have not tried it yet. I love using homemade cleaners! Thanks for sharing it with SYC. Hi, I just found your tile cleaner recipe through Kelly's corner and tried it on my kids bathroom today. I worked fantastically and so cheap to make. Cleaning products are so expensive here in Australia and thus I am excited to find your cleaner. Thanks. Thanks for the great tip! I'm all for reducing fumes and harsh chemicals that really work to cut the soap scum in the bathroom. Your image would look really cool if you did it in picmonkey with labels and a list of supplies needed. Just found this great recipe for tile cleaner. One word of caution for anyone wanting to bleach the grout lines at the same time.... Bleach and ammonia mixed together are toxic!! Don't mix together. I am totally into the whole DIY cleaning product thing. I don't have any tile in my bathroom, but I'm wondering just how well this would work on the shower floor. Pretty well, I'm guessing, so I'm going to give it a try. Thoughts for Thursday...movies, summertime, etc. Thoughts for Thursday...books, empty nest, etc.